Mandalay was the last royal city in the country before the British occupation we bring history and more than one hotel in the city plus plenty of pictures including the Irrawaddy River (Ayeyarwady River). Today the city is the center of the northern half of Myanmar and also the hub for traffic culture and business. Since Myanmar has the size of Great Britain and France combined with more than 100 different exotic tribes you can imagine that a large and diverse country. Kipling's text in "The road to Mandalay" is well known and today this name is used for a couple of tourism enterprises among them is the river cruise ship operated by the Orient Express company.The ship is cruising between Mandalay City and Bagan and no need for a hotel in Mandalay when taking this journey everything is on board and it is very expensive. This company also runs the Eastern & Oriental Express luxury train between Bangkok and Singapore which is pure luxury travel. There is also more than a dozen excellent hotel in Mandalay which makes travel easy. There are also several flights from Yangon and Bangkok every day plus buses and a train connection which makes tours to Mandalay quite easy within a reasonable time stamp. Day tours are available to visit the famous monasteries plus pagodas Buddhist Temples and the Mandalay Palace. Cultural and life activities are plenty one of the best is probably a short cruise on the Irrawaddy River (Ayeyarwady) to the pagoda studded Sagaing side and up-river to Mingun and other fascinating day tour destination naturally all this needs Mandalay Hotels. Please check the icon at top right for your choice of a suitable Mandalay Hotel and Resort and get inspired by our website and maybe a guided tour. If you are in the mood for a soft adventure tour get down to the Irrawaddy River Banks and hire one of the small ferry boats to cruise upriver until about the temples of Mingun. Today Mandalay City is the center of upper Myanmar which is the northern half of the country the hub of Burma in terms of culture and business. 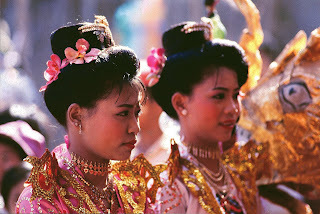 Since Myanmar has the size of Great Britain and France combined it is quite a large country with 134 ethnic minorities. 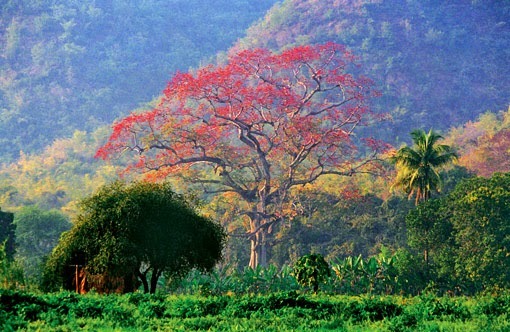 One of the best known writings concerning Mandalay is probably Kipling's text "The road to Mandalay". This name is used today for a couple of tourism enterprises among them is the river cruise ship "Road to Mandalay" operated by the Orient Express company and cruising between Mandalay City and Bagan actually Irrawaddy River tours between this two ancient cities are for sure highlight on every Burma tour.. Since around the beginning of this century thousands of Chinese who want to get away from their overpopulation natural disaster and more settle in the Mandalay region and vicinity. Until now (2017) already more than two million Chinese started a new life in the area. Most native say they are not capable anymore to live in the in the city since real estate and rental prices virtually exploded when the neighbors from the north came in. At Mandalay, all these old Burmese cultural traditions can be experienced in real time. Exotic cities of Myanmar's past are around such as Amarapura, Shwebo, Sagaing, Monywa and almost every hill is occupied with golden and white Pagodas plus temples and shrines show the dedication to Buddhism. Aside from the migration and economic issues the city is a must for anyone who travels in Myanmar. If someone hasn't been in Mandalay and Bagan they never really been in the country. Famous old and significant monasteries pagodas temples handicraft art give a feeling of the past when colonial times was still on. The city is accessible by air rail and the Irrawaddy River (Ayeyarwady) currently (2017) river traffic is only between Mandalay and Bagan and from the city about 100 km to the north because of continuously shifting sandbanks. Actually, during British colonial times, the problem was under control and the rivers of Myanmar had substantial travel over the whole network. A new Mandalay international airport has been installed a few years ago, the problem is, there is often no electricity. Sometimes during the years, there is one international flight between Mandalay and Chiang Mai in Thailand. Maybe this will improve in the future to open up the city internationally, few years a helicopter service was available between the city and the world ruby capital Mogok, there are plenty of rich people in the region. The emergence of the Mandalay City has an interesting and poignant legend behind it. 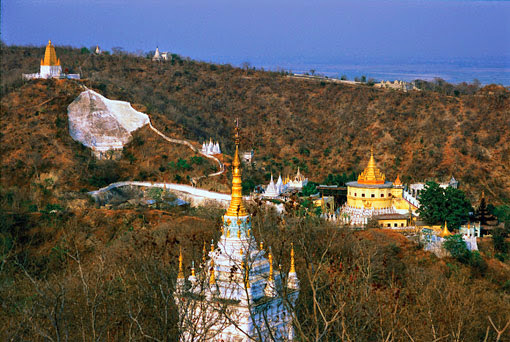 Once the Gautama Buddha and his disciples happened to have a sojourn on the summit of the Mandalay Hill. Buddha gave a sermon to the assemblage, including an ogress who was very much pleased with the teaching. The ogress wished to offer something to Buddha but unfortunately, she had nothing to offer. At that instance, the ogress cut off her breasts and presented it to Buddha. Buddha solaced her and told that the ogress would be born again as a prince and when ascending the throne a new city at the foot of the Mandalay Hill will be created. This somehow turned out true as Mandalay was founded by King Mindon who arranged the Fifth Buddhist Synod in 1871, this was all before the British occupation. King Mindon born 1814, Amarapura, died Oct. 1, 1878. Mindon was a brother of King Pagan (reigned 1846–53), who was king during the Second Anglo-Burmese War in 1852. The father of King Thibaw reigned from 1853 to 1878. In 1857 he gave the order to move the capital from Amarapura to a new site. Chosen was a suitable place near the holy mountain, Mandalay Hill. According to the legend, Lord Buddha had stood here once with his disciple Ananda. From there Lord Buddha pointed towards the South-West prophesying that sometime in the future a city of great religious importance would be built there. King Mindon chose this spot and named the new city Mandalay. After four years building the royal palace was finished in 1859. During his reign, he strongly supported culture and religion. He tried hard to make Mandalay a center of Buddhist learning, convening the Fifth Buddhist Council there in 1871. King Thibaw and Queen Supayalat (picture is from 1880) he has been the last Burmese Ruler. His short reign (1878–85) ended with the occupation by the British. In an attempt to play the French against the British, he gave economic concessions to the French and they proposed political help but the Brits started all kind of foul play and finally war. When the British sent King Thibaw to exile chaos came up and during this time all the royal regalia was looted. Some pieces were recovered and are on display at the National Museum in Yangon. The hintha bird casket (right) is one of the most beautiful items on display, made from solid gold, set with rare rubies and other precious stones. There are other items like ceremonial bowls, water pitcher, cup holder, crayfish pitcher, betel boxes and spittoons decorated with designs of mythical creatures and flowers. Despite strong conservative opposition, Mindon initiated several reforms. The most important reforms he did on the land tax plus fixed salaries for government employees. He standardized the country’s weights and measures. A program to build roads and a telegraph system were started. He also was the first king to issue coinage, for more about Mandalay palace and history read more here. They forced him to sign a treaty to split the country, cut Burma off from the sea and took some of the best teak forest and Mandalay Myanmar rice growing regions under their control. The king also started industrial reforms, many foreign types of machinery were imported and set up (about the same time when the Japanese under the Meiji dynasty did the same). Unfortunately the British destroyed all industrial setups when they took control of the whole country. This was according to their doctrine to force their colonies to function as supplier of raw material only. King Mindon died in an all teak pavilion within the palace city. King Thibaw donated this building to be used as a monastery. The time was ripe when Thibaw charged the British-owned Bombay - Burmah Trading Company, which cut teak logs from the Ningyan forest in Upper Burma, of cheating the Myanmar government. A fine of £100,000 was imposed. The Indian viceroy, Lord Dufferin, sent an ultimatum to Mandalay. In October 1885 demanding to drop the case. Thibaw ignored Lord Dufferin's request. On Nov. 14, 1885, the British invaded Upper Burma and captured Mandalay after two weeks. Thibaw was deposed and Upper Burma included as ap province of British Burma. They were deported by the British colonialists into exile in India until his death. 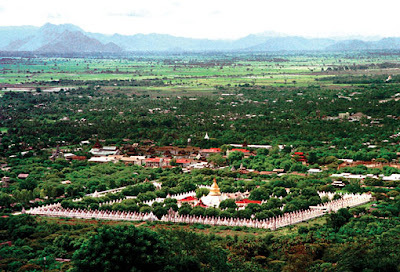 Mandalay City is making an immense transformation since around the beginning of this century. When thousands of Chinese who want to get away from their overpopulation, natural disaster, and more settle at Mandalay and vicinity until now (2018) already more than two million Chinese started a new life in the area. the native says most are not capable anymore to the in the city since real estate and rental prices virtually exploded since the neighbors from the north came in. At Mandalay, all these old Burmese cultural traditions can be experienced in real time. Exotic cities of Myanmar's past are around such as Amarapura, Shwebo, Sagaing, Monywa and other and on almost every hill golden and white Pagodas and temples show the dedication to Buddhism. Aside from the migration and economic issues the city is a must for anyone who travels to Myanmar. If someone hasn't been in Mandalay and Bagan they never really been in the country. Famous old and significant monasteries, pagodas, temples, handicraft, art etc. give a feeling of the past when colonial times was still on. In our website, you will read things you never heard of and you will see pictures nobody has ever seen before. Since most of our Mandalay pictures are of high quality and similar have never shown before plus an excellent text around we remind everyone all this is copyright protected. The last two Kings of Myanmar, King Mindon, and Thibaw resided in the Palace. A panoramic view of Mandalay, Hotel in Mandalay, the road to Mandalay, Myanmar Mandalay, Mandalay history, Mandalay pictures, Mandalay beach, Mandalay monastery. 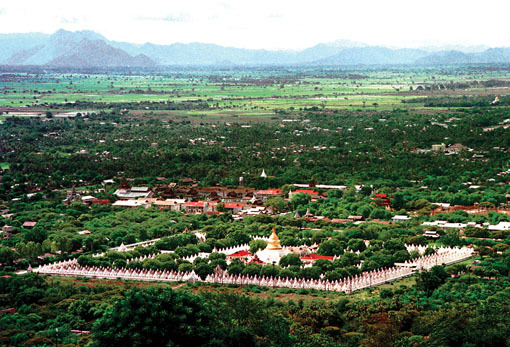 towns like Amarapura, Sagaing, and Monywa famed for Myanmar arts and crafts and religious monuments. At Mandalay City the most interesting are probably the palace which was burned down after a hit by a Japanese bomb and but completely renovated in the 199X ties. 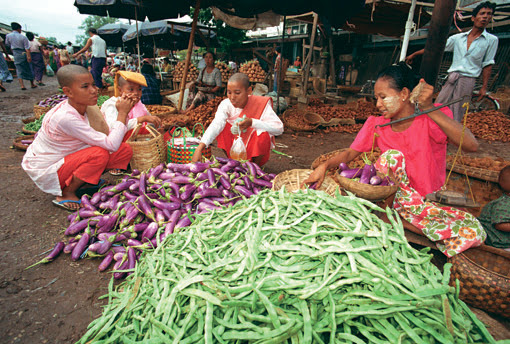 Myanmar was devastated by the World War II and the British evacuation and the reoccupation. During the war, many significant buildings were either burnt down or heavily damaged. That included many structures in Mandalay, including the King’s palace. However, they and many buildings were rebuilt on the original ground and old model. The city is accessible by air, rail, and the Irrawaddy, currently (2011) river traffic is only between Mandalay and Bagan and from the city about 100km to the north because of continuously shifting sandbanks. Actually, during British colonial times, the problem was under control and the Irrawaddy, Chindwin and other rivers of Myanmar had substantial river travel over the whole network. The Mandalay Airport has been installed a few years ago, the problem is, there is often no electricity. International flight between Mandalay and Chiang Mai plus Bangkok in Thailand have been inaugurated. Maybe this will improve in the future to open up the city internationally, few years a helicopter service was available between the city and the world ruby capital Mogok, there are plenty of rich people in the region. Despite strong conservative opposition, Mindon initiated several reforms. The most important reforms he did on the land tax plus fixed salaries for government employees. He standardized the country’s weights and measures. A program to build roads and a telegraph system were started. He also was the first king to issue coinage for more about Mandalay palace and history read more here. Mandalay was the last royal city in Burma sacked by the British and they exiled the royal family from their Mandalay Palace to India. Although at the first glance the second biggest city in the country looks not attractive but if you take a tour guide who is MTT certified you will be really surprised what's up here on the historical side Buddhism plus arts and crafts. Really even today most people are not aware of it but after you went the first time through the palace and crossed the Irrawaddy to Sagaing and Mingun all this will change. 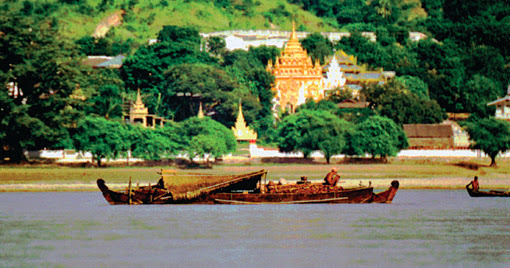 We show more than one hotel in Mandalay including history and plenty of pictures. Mandalay monasteries pagodas Buddhist temples handicraft and lots of cultural activities plus vicinity around Amarapura Sagaing Mingun and more. Today the city is the center of the northern half of Myanmar and also a hub of the country in terms of culture and business, Myanmar has the size of Great Britain and France combined. 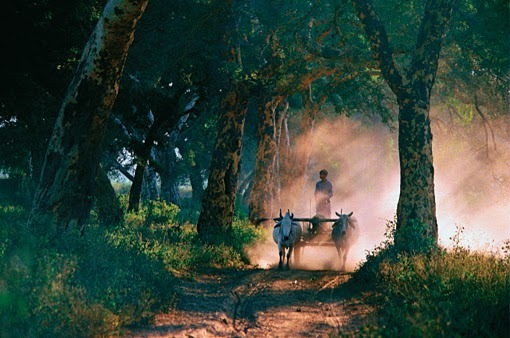 One of the better known concerning Mandalay is probably Kiplings text.."Road to Mandalay". This name is used today for a couple of tourism enterprises among them is the river cruise ship "Road to Mandalay" operated by the Orient Express company and cruising between Mandalay City and Bagan. That is a high-end luxury journey this company also runs the Eastern & Oriental Express, train between Bangkok and Singapore. There is also more than one excellent hotel in Mandalay which makes travel very easy since there are also several flight from Yangon everyday, one flight per day from Bangkok Airport plus buses and a train connection from the former capital. The picture above show the Mandalay Palace wall and moat about 10 years ago (today is 2018). The Mandalay photo above shows the moat and the hill in the back. It was taken from the Sedona Hotel Mandalay which is right in front of the palace definitely a great location. Here is the Mahamuni Temple and Pagoda with inner turtle pond this temple precinct is one of the most venerated in Myanmar. A cruise on the Irrawaddy pictured from the Mandalay side opposite is Sagaing it shows almost nothing had changed since the British left. Here are Buddhist retreat centers for rehabilitation of various kinds including drugs and getting help to get back on track.